"My mother made this often when I was growing up. Lovely for breakfast, brunch, or light lunch. Serve this alongside a couple slices of good quality bakery bread, toasted and buttered. 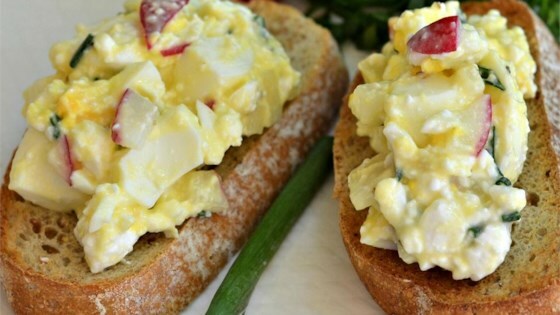 Keeping hard-cooked eggs in the fridge makes this easy and quick. You can adjust the amounts of chives and radishes, or even add an extra egg, depending on your taste." Stir cottage cheese, egg, chives, radishes, and salt together in a bowl. The classic wedge is elegant and delicious! This was........interesting. Not bad, just interesting. I did add some fresh ground pepper but other than that, I kept to the recipe. I used garden fresh chives and radishes. I shredded the radishes and added pepper. I used it as a dip with pretzel thins. I think next time I'll use more radishes. Way to bland - I added seasoned salt and cajun seasonings which still didn't help. Thanks anyway.